We are the Guardians for Our Breed! But problems can become opportunities. Problem: The genetic aspect of many diseases is still unknown, and researchers continue to look for specific disease-causing genes and their mutations. Opportunity: Genetic diversity testing and analysis are now available and can immediately show owners and breeders the risk for disease by assessing overall genetic similarity within our individual dogs, the breed in general, and a possible mate selection. It is important for our breed’s diversity to take advantage of the additional tools that have been made available through the University of California at Davis Veterinary Genetics Laboratory (UC Davis VGL) and BetterBred.com. UC Davis VGL performs the genetic testing service, while BetterBred.com analyzes the UC Davis VGL data and provides owners and breeders with the actual genetic information about individual dogs, breeding pairs and possible litters prior to making breeding decisions. Problem: Research has shown that both simple and complex genetic diseases are more likely to be found in dogs with common ancestors. Opportunity: The use of genetic diversity testing and analysis will not only provide insight into the genetic diversity of our breed, it can also be a lasting resource to inform and guide breed planning. The genetic analysis results will ensure that breeders and owners know which dogs in our breed are the least related genetically so they can make sure the diversity within our breed is preserved and becomes better distributed throughout our breed. Analysis can provide valuable genetic information that can lead the way for breeders to begin to develop a strategy for improving the long-term viability of our breed’s gene pool. Q: Why does our breed need a genetic diversity test? 1. UC Davis VGL reports that Flat Coats are one of the least genetically diversified breeds, second only to Doberman pinschers. Looking at the UC Davis VGL graph below, one can see how clustered our breed (FR, in blue) is. 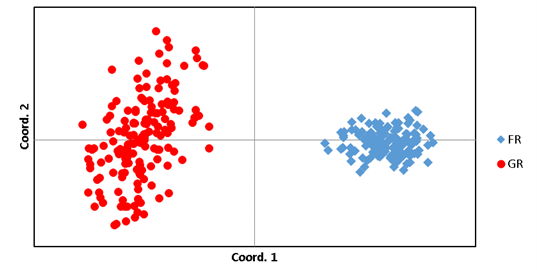 The comparison using the Golden Retriever (GR, in red) was used for the graph because both breeds had similar numbers of dogs tested at the time of the reporting. We need genetic diversity in Flat-Coated Retrievers to ensure, and possibly improve, the breed’s health and longevity. Genetic diversity is considered by scientists to be essential to maintaining a breed’s soundness, vigor, fitness and future. Research has linked a species’ and breed’s lack of genetic diversity to growing genetic health problems. 2. Other breeds have been forced to outcross to another breed to solve serious health issues. The time may come when our breed’s health issues have grown too large to overcome by continuing to breed only to Flat-Coated Retrievers. 3. If breeders do not focus on genetic diversity, our breed will lose genes every generation. Once lost, those genes can never be replaced. Every dog tested makes a valuable contribution to the genetic knowledge of our breed’s present gene pool and the future health of the breed. Genetic diversity testing and analysis will inform breeders about what genes individual dogs have. Knowing what genes are presently available will help breeders to maintain and diversify the present gene pool. Having rare genes makes a dog as valuable as one with OFA Excellent hips or a Dual Champion certificate. Q: How can breeders use genetic diversity results? Scientists agree that genetic diversity testing and analysis is a valuable tool for controlling genetic diseases. Research has shown that dogs with the most common genetics are shown to be at a higher risk for breed-specific diseases. The Flat-Coated Retriever Society of America (FCRSA) is presently using two organizations for genetic diversity. It is vitally important to use only one testing-and-analysis service as other forms of genetic testing are not compatible with UC Davis VGL and BetterBred.com. Test results are provided by UC Davis VGL. Analysis of those results is provided through BetterBred.com. Breeders can use these genetic diversity results just as they already use tests for and analyses of health, longevity, type, structure, temperament, inbreeding and performance. Breeders do not need to lose breed type, temperament or working ability when applying genetic diversity results to their breeding programs. Genetic diversity results are a far more accurate assessment of the genetic relationship between dogs than the old-fashioned Coefficients of Inbreeding (COI) estimates. Uses the actual “genetic relationship” between two dogs, unlike the COI, which provides only a statistical estimate. Like many statistics from earlier times, today’s science has proven to be far more accurate. Allows us to know the number of unique and common genes within our dog’s pedigree and possible mating. Still allows us to know the number of unique and common ancestors within our dog’s pedigree and possible mating. Helps us avoid doubling up on harmful genes. The genetic diversity analysis allows a breeder to see the potential genetic outcomes of test breedings before doing the mating. Analysis scores test breedings on a diversity standpoint, using a scale of 1 (weakest) to 10 (best), just as the OFA scores hips from severe to excellent. Breeders can include genetic diversity in their decision-making process, just as they use hip and elbow scores, titles, structure, etc. BOTH the male and the female need to be tested and entered for analysis to provide breeders with more choice when making important breeding decisions—so test and analyze your dogs TODAY! Try not to breed dogs with too many of the same exact ancestors. Breeding with too many of the exact same ancestors’ allows those genes, the good and the bad, to be much too common within our breed. By having a more varied ancestry and retaining many different lines, we will allow our breed to have more variety in our genetics and dilute the disease gene combinations. To help increase our breed’s diversity, genetically unique dogs should be bred to dogs that are equally unique, thus producing more overall diversity. The resulting litter should then be tested and the best overall puppies with the lowest Average Genetic Relatedness should be kept intact. The more unusual the adults and puppies are, the more important it is that they are bred, and bred to other unusual dogs. These dogs are responsible for maintaining diversity, so they should be generally healthy, long-lived, have decent structure and good temperaments, but they don’t have to be perfect in type. Common dogs (dogs with similar genes) are also more at risk for breed-specific diseases. Common dogs should be selected very carefully, because they are responsible for putting selection pressure on the rest of the breed for proper breed type, temperament and health. Excellent-quality common dogs should be bred to more genetically unique dogs and the best of their puppies that have the lowest Average Genetic Relatedness should be kept intact. With effort on all of our parts, and by using genetic diversity testing and BetterBred analysis, we may be able to reduce some of our breed-specific diseases while at the same time preventing new diseases from becoming all too common. Some diseases are fixed within the breed, while others can still be bred away from with care. We want to prevent our breed’s diversity from becoming so depleted with too many common risky genes that we need to outcross to another breed. The choice is ours—so please consider implementing these new tools into your breeding program, as conservators of our breed. Q: How can a dog from any country be tested and analyzed? Order your swab kit by visiting the UC Davis VGL website. Create an account, sign up and pay for the genetic diversity test. The cost of the test is $80. To receive the $25 FCR Foundation reimbursement, you must be a member of the FCRSA. Email a copy of your paid invoice to Mary Beth Bissig. After receiving your kit in the mail, swab your dog according to the included instructions, and return the swabs to the VGL. Don’t worry, swabbing is easy! When you receive your dog's results via email, forward a copy of that email and attachments (your dog’s VGL Genetic Diversity Certificate and Diversity Panel) to Barbara D. Krieger for inclusion in the BetterBred database or enter your dog’s genetic diversity information into Betterbred.com yourself. Knowledge is power. Without it, we have no control. We must accept the fact that the Flat-Coated Retriever does indeed have a lack of genetic diversity and various health issues. We all can rise to the challenge of being responsible for the future health and well-being of our breed by making every effort to protect the diversity we presently have with the hopes of improving it in the future. The statistical genetic diversity analysis of all of our dogs is of vital importance. We all need to be a conservator of our breed and test our dogs through UC Davis VGL and enter them into BetterBred.com.